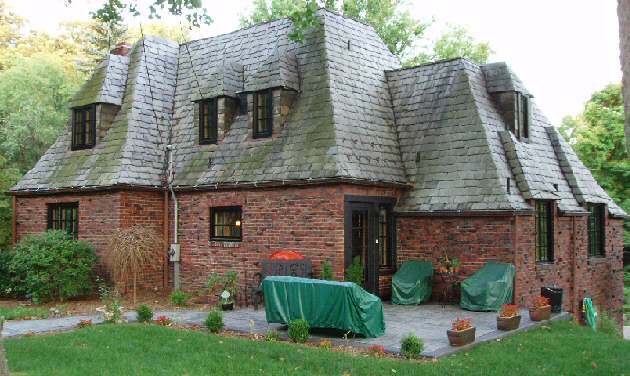 Slate Roof Central Message Board: Slate covered window dormers - how to mount awnings? the top of the roof is almost flat - it's bent copper that's about 8' wide and maybe 18-20' long on the very top and maybe 3' wide by 8' long on the second portion on the right. The windows are brand new - we took out double hung and put in the casements to get the house looking closer to what it did when it was built. Steve- the casement windows do make it rough.. if you re-windowed to double-hung windows, you might/could then use a small, un-imposing awning like those ventshade things for cars and just pull the upper sash down(which you'd want to do, anyhow) a little- maybe just re-window or put the full-size awnings around back where no one will notice? Do you have a roof hatch and is that a flat roof on top?- just an idea about putting a small A/C up there especially if you could sorta' hide it at the rear edge..? or- Run the refrigerant lines down through the house in a chase? I guess one visit saves a 1000 words, huh? The house was built in 1936 and does not have central A/C. We have hot water heat, so it can't be retrofitted via the furnace. I've seen the attic mounted A/C systems but am not crazy about running the condenser lines out of the roof and down the side of the house. Besides cutting the amount of sunlight coming into the house down drastically the thinking is that with the awnings installed we can leave the windows open more often, especially when rain is forecast and not worry about getting the inside of the house soaked (the windows are casements and open outward). What about inside shades, awnings seen to change this great house you have. We are looking at the possibility of installing canvas awnings on our home to reduce the amount of sun that we get during the summer months. Since I am very protective of my slate, I thought I'd solicit comments from those in the know and not rely on an awning company to tell if if this can be done or not and risk damage to my precious slate. I've been having a hard time trying to figure out how they would be mounted on the second floor of the house since the entire second story is surrounded by slate (roof and the siding on the window dormers). I am hoping that someone here can tell me whether or not it can be done without destroying the slate on the dormers.